Oliver's Twist » Martin Luther King, Jr’s dream not yet reality; continue the stuggle! 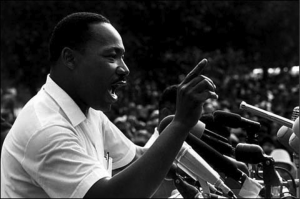 Martin Luther King, Jr’s dream not yet reality; continue the stuggle! Today marks the 50th anniversary of the 1963 civil rights march on Washington, D.C. at which Martin Luther King, Jr., delivered his famous “I Have a Dream” speech. As a family medicine researcher interested in understanding, explaining, and fighting against racial health inequalities, I also think it’s important to note that Martin Luther King also noted the injustice of racial health inequities. In a speech in 1966, King said that “Of all the forms of inequality, injustice in health care is the most shocking and inhumane.” Racial health inequities are a special instance of social inequities and social injustice in general. In commemorating the historic 1963 March on Washington and the movement that it was a part of, we need to be mindful of the fact that much work is left to be done to achieve the goals of the civil rights movement. Why has the law failed to undo the segregation that was originally caused by the law? The most obvious reason is that racial segregation of neighborhoods remains the norm in the U.S., as demonstrated in the city maps on this site. To the extent students attend neighborhood schools, they are likely to have few classmates of other races. But the courts, too, have played a role–initially by acquiescing in state resistance to desegregation, more recently by attacking the tools states use to achieve integration. “And so we must say, now is the time to make real the promises of democracy. Now is the time to transform this pending national elegy into a creative psalm of brotherhood. Now is the time to lift our nation from the quicksands of racial injustice to the solid rock of racial justice. Now is the time to get rid of segregation and discrimination. Now is the time.